March may be an unusual time to start a new international cycle, but the upcoming fixtures offer a chance to see some of the game's best young talents. Euro 2020 qualifiers are set to get under way while South American teams including Brazil are continuing their preparations for this year's Copa America. New campaigns are a natural opportunity to bring in fresh blood and that is just what international managers around the world have done in their latest squads. But who are some of the players who could make their international debuts this week? Omnisport has picked out six of the most exciting rising stars to watch. Republic of Ireland fans were gutted when Rice opted to represent England, but their loss is the Three Lions' gain. Rice represented Ireland in friendlies but, as he had not played any competitive games, he was free to join up with Gareth Southgate's side. A smooth defensive midfielder who can also play at the back, West Ham's Rice, 20, looks an ideal fit for Southgate's Nations Cup semi-finalists due to his composure on the ball. England have also called up Chelsea teenager Callum Hudson-Odoi for the first time this month. Ajax attacker Neres was not initially named in Brazil's squad for a double-header of friendlies this month as Tite's side tune up for the Copa America. But an injury to rising Real Madrid star Vinicius Junior saw Neres called up in his place, with the winger rewarded for a fine run of form that has helped Ajax qualify for the quarter-finals of the Champions League - at the expense of Madrid. With five goals and eight assists in the Eredivisie, 22-year-old Neves has enjoyed a breakthrough season for the Dutch giants. Portugal have welcomed back Cristiano Ronaldo for the start of their Euro 2020 campaign, but Euro 2016 winning coach Fernando Santos could blood a new generation of talent, too. Felix is considered one of the best young players in Europe, the 19-year-old having scored 10 goals in the Primeira Liga this season to earn links with Manchester United. Another potential debutant for Portugal during the international break is Wolves attacker Diogo Jota, who hit a hat-trick in a Premier League defeat of Leicester City in January. Joachim Low raised eyebrows with the shock dropping of experienced Bayern Munich trio Mats Hummels, Jerome Boateng and Thomas Muller, but his hotly debated decision should clear the decks for new players to burst through. Among them is Eggestein, with five Bundesliga goals for Werder Bremen this season drawing Low's attention. His versatility – Eggestein is able to sit in front of the defence or play a more creative role – should make the 22-year-old a long-term asset for Germany. Borussia Dortmund's charge in the Bundesliga has owed plenty to Jadon Sancho, but there are several exciting young talents available to Lucien Favre and one of the most impressive is Bruun Larsen. Set to make his senior Denmark debut this week, the 20-year-old should develop a thrilling combination with Tottenham midfielder Christian Eriksen, his pace and direct running on the flanks likely to cause problems for Group D sides including Republic of Ireland and Switzerland. Arguably the best of the bunch, Roma teenager Nicolo Zaniolo should make his international debut for Italy in the coming days. 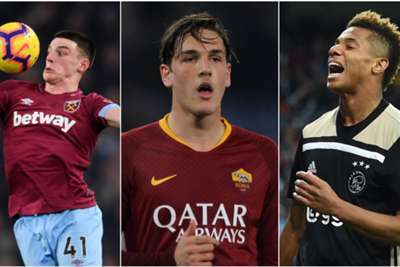 Zaniolo joined Roma as part of the deal that saw Radja Nainggolan switch to Inter and the Nerazzurri may come to regret allowing the 19-year-old to join a Serie A rival. Zaniolo has been the brightest spark in a disappointing season for the Giallorossi, scoring three league goals and netting a Champions League brace in a last-16 tie against Porto.